Timothy B. Vigil is an American comic book artist, mostly working in the horror/adult genre. His main graphic novel Faust (with co-creator David Quinn) was adapted by Brian Yuzna as the 2001 movie Faust: Love of the Damned. The followup Faust: Book of M, was nominated for the 1999 Bram Stoker Award for Best Illustrated Narrative. 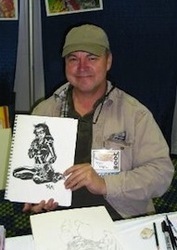 He received his first popular exposure for his work on the comic title Grips, published by the defunct publisher Silverwolf Comics.